Here’s a little engraving I did for a friend of mine for her birthday. 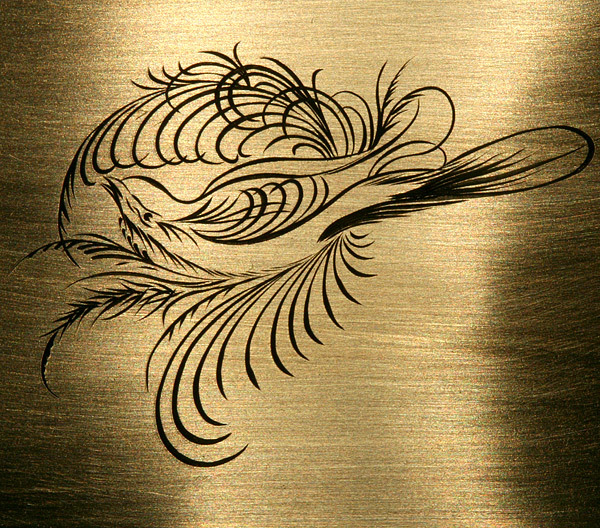 Technically it’s very simple engraving, just some lines here and there, but I think the final result looks quite good. It was also a ‘quickie’, total engraving time was about 90 minutes. I’m not completely satisfied with it, because it has quite a few not-so-smooth lines here and there, can you spot them? They’re actually easier to spot on photo than on real life, the actual width of this bird is 4cm. Not so big. For some reason I just couldn’t get the design to transfer well to the place and half of the lines were missing, so I had to engrave by guessing where they should be. Design was from copyright free designs made by unknown (to me) artists long-long time ago.